Holmes, Hazel E. age 95 of Montgomery passed away on July 7, 2015. 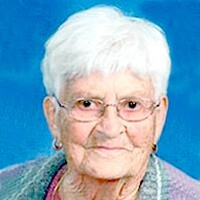 She was born on November 9, 1919 in Cordova Twsp, LeSueur County to Lloyd and Lillie (Preble) Squires. Hazel graduated from Sherman High in Montgomery, Class of 1936. She attended Teachers training and Mankato State University. Hazel entered the Prior Lake School System in 1955 teaching 1st grade. She received her Master's degree from Mankato State College in 1966 in Special Ed. She then initiated the Special Ed program at Prior Lake. In 1962 she accepted the position of Principal at the newly constructed Westwood Elementary School in Prior Lake . She held that position until her retirement in 1978. She enjoyed quilting with the West Area Quilters and fishing with her family on Mille Lacs Lake. Preceded in death by her parents, first husband, John B. Novotny, daughter Bonnie (Novotny) Stasney and son John L. Novotny, son-in-laws Clarence Stasney and Clair 'Sam' Sautter.Survived by husband Donald Holmes, children Ellen (Ron) Dubbe, Shirley Sautter, Robert (Maureen) Holmes, Renee (Mike) Holt, and Mark (Tina) Holmes; Numerous Grandchildren, Great Grandchildren and Great-Great Grandchildren.Visitation will be at 2pm at St Johns Lutheran Church in Montgomery on Friday, July 24, 2015. Memorial service at 3pm. Interment will be at St Johns Lutheran Cemetery. Arrangements by Keohen Funeral Home in Montgomery.